Being the alchemist he is, Mad Mike went to the lab with a bushel of fresh peaches, and emerged with this insane, great flavor! A perfect Peach and Sweet combination! "You won't look at Peaches the same again." So are you scared...? Then this flavor is for you! There is absolutely NO HEAT in this one. 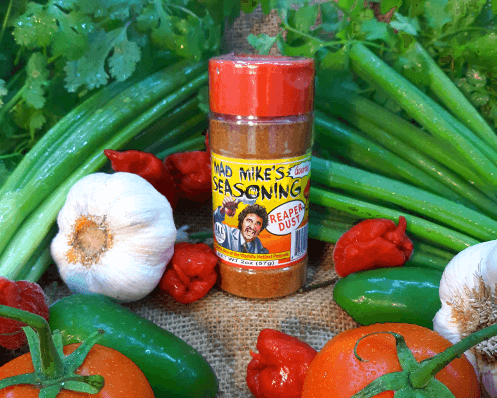 Instead of using the Carolina Reaper pepper, Mad Mike uses a SWEET Pepper in this flavor. Even your grandma can eat this one! 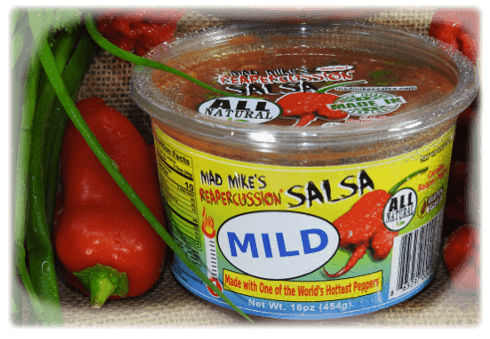 As crazy as it sounds, Mad Mike was able to just add enough of the Carolina Reaper Pepper for you Mild mannered folks! "When Medium is too hot, this one is for you!" 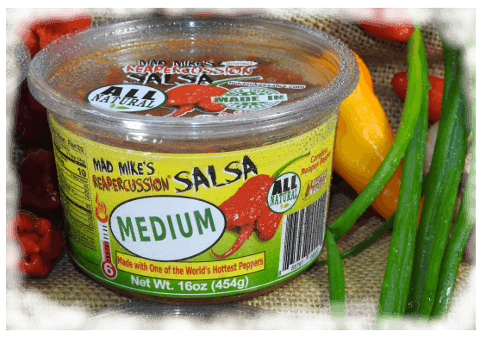 How do you take one of the World's Hottest Peppers and make it MEDIUM? Well after many attempts, Mad Mike finally figured out the perfect blend for his MEDIUM. "This is NOT your Grandma's Medium Salsa." 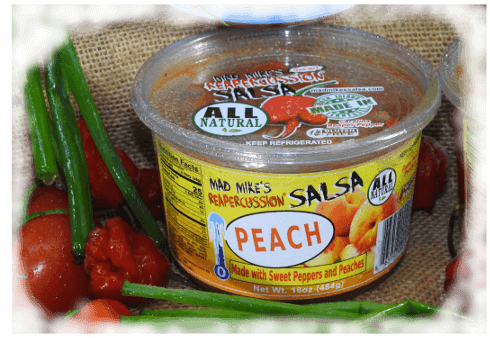 This flavor is super popular with every pepper lover! 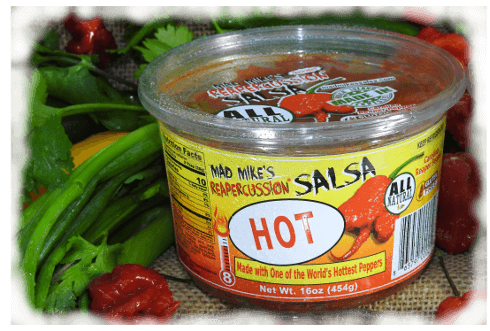 It will satisfy any hot pepper craving you might have, and it is just HOT enough to keep you eating it. 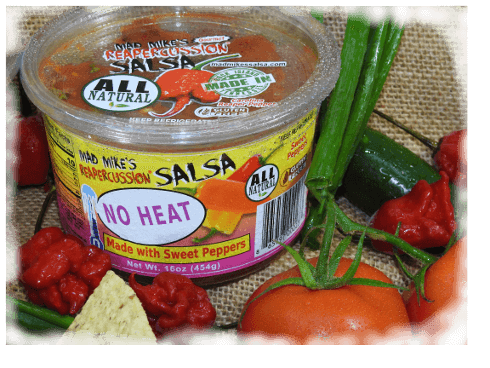 "Hotter than any other HOT Salsa on the Planet!" 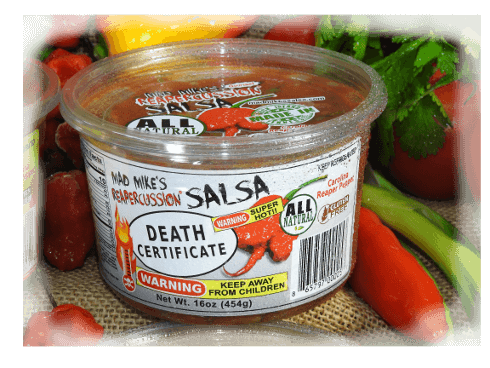 There are (2) whole Carolina Reaper peppers per container of Death Certificate! Seriously, you will wish you were dead after eating this flavor. "Any hotter and it would melt the container! Keep away from children." Also Available from Mad Mike! · "Another One Bites the Dust!" Click to find out more about it!